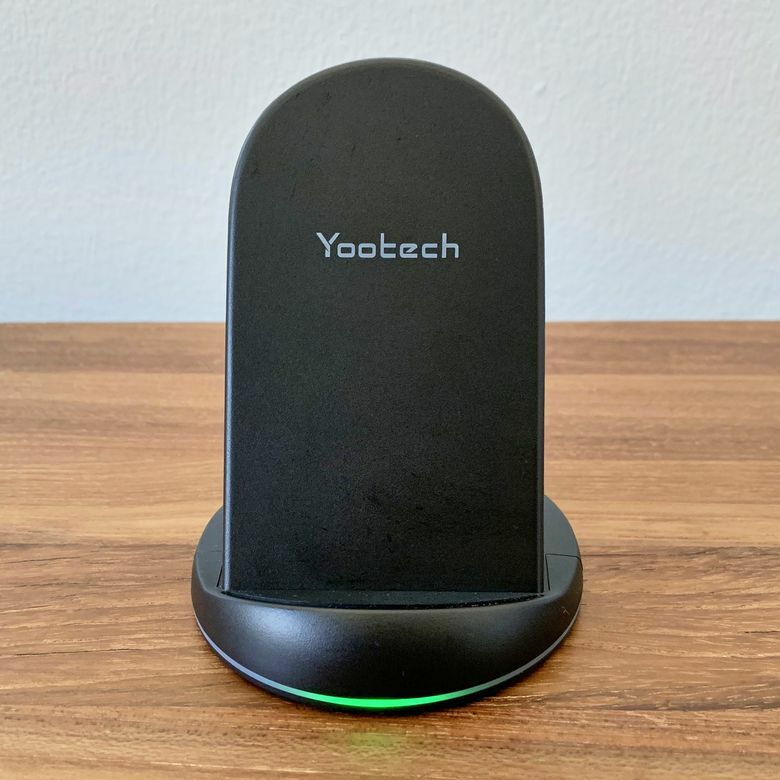 The Yootech Wireless Charger Stand is a budget-friendly charger that offers, a minimal design, and some intelligent charging features to prevent overheating. The wireless charging market is a crowded place with consumers having many options among third-party chargers. The Yootech Wireless Charger Stand is one among many that take advantage of fast wireless charging to top up your phone without a cord. Not only that, it also has some intelligent features to keep your stand and device cool, at a price that won’t break the bank. We put it to the test to see how it fared in regular usage. The Yootech Wireless Charger Stand has a sleek and minimal design with curved edges. The charging area is wide due to the presence of two charging coils, letting your phone charge no matter where you place it. The base of the stand has an LED light that wraps all the way around the stand and lights up when it’s in usage, turning off after about 15 seconds. The green light looks really cool as it dances around the base to let users know the device has been detected and the charging has begun. As with other stands, you can use your phone in portrait mode or landscape mode without a problem. Yootech includes a user manual and a charging cord in the package. The setup process is not rocket science and the hardest part of all of this is connecting the cable to the micro USB port of the stand. You’ll also need a separate fast-charge compatible power brick since one isn’t included by default. Once this is ready, you simply place your phone on the stand, the green light circling base will start flashing and your phone will be replenished in no time. For our test of the Yootech Wireless Charger Stand, we used an iPhone XS Max that was completely dead. We had previously depleted the battery down until the screen shut off entirely. We let it rest for about an hour to make sure it was all cooled down. Once we placed the phone on the stand, it charged to 100% in just over three hours, which is a bit longer than other chargers we’ve tested. Once we placed the phone on the stand, it charged to 100% in just over three hours, which is a bit longer than other chargers we’ve tested. Yootech boasts about their “intelligent temperature protection” that stops charging when it gets overheated to protect the phone, but we didn’t have any issue with overheating. The Samsung Galaxy S9/S8/ S8 Plus/ S7 Edge/S7/ S6 Edge Plus/ Note 5 will charge at 10W speeds, while iPhone X/XS/XSMax/iPhone 8/ iPhone 8 Plus charge at 7.5W output. Other Qi-enabled devices will resort to the standard 5W speeds which is quite a bit slower. The Yootech Wireless Charger Stand also lets users charge their phone with a case on as long as it doesn’t exceed 6mm in thickness. The manufacturer suggests that for best results, you charge the phone without a protector. The Yootech Wireless Charger Stand costs under $20, which is a great value for the technology packed into the small form factor — especially if you're an iPhone owner. Take a look at the alternatives from Apple, which retail anywhere from $40 to $160. And, if you opt for wired fast-charging for your iPhone, you still have to buy an 18W USB-C Power adapter and a USB-C to Lighting cable, which is almost equally expensive and doesn't take advantage of the phone's Qi compatibility. The Yootech lets you use this futuristic feature without shelling out for the smartphone brands' premium priced wireless chargers. The Yootech Wireless Charger Stand has a sleek and minimal design with curved edges. The Yootech Wireless Charger Stand is an awesome way to tap into the built-in inductive charging technology on your smartphone. That said, with the market saturated with alternatives, there are many options for consumers to pick from, like the fast-charing one from Choetech. Both charge at the maximum speed for their respective devices, but while the Yootech stand has a fun green LED light around the base, Choetech has three faint dots. From a more stylish perspective, we preferred the Yootech, but you might want something more muted for your bedside table. Read more reviews of the best wireless phone chargers available to purchase online. Affordable, effective, and worth buying if you don't need the absolute fastest charging speeds. Yootech Wireless Charger Stand has great technology packed into the sleek and small stand. Consumers will feel that they are getting what they paid for and even more. If you are a Samsung or Apple user you can rest assured that you are receiving optimal speeds to charge up at 10W and 7.5W speeds, respectively. Product Dimensions 3.6 x 3.6 x 4.3 in.